Elected intendant September 2, 1833, succeeding Henry L. Pinckney. Re-elected September 1, 1834, and September 7, 1835. Succeeded by Robert Y. Hayne, September 1836. Born 1778, died May 15, 1843, buried in St. John's Lutheran churchyard. Son of Edward North and Sarah Baker, married Mrs. Jane Caroline (Gough) Parker, 1802; married Mrs. Arabella Ann (Rhind) Dart, 1826. Graduate M.D. (1797), University of Pennsylvania. Physician with office on Meeting Street. Surgeon stationed at Fort Moultrie and Fort Johnson during War of 1812. Charleston Courier, September 4, 1833; September 2, 1834; September 9, 1835; September 7, 1836. Waring, Joseph Ioor. A History of Medicine in South Carolina, 1825-1900. South Carolina Medical Association, 1967. 54 Montagu Street was built between 1806 and 1809 for Isaac Motte Dart (d. 1825) and his wife Arabella Ann Dart. In 1826 Mrs. Dart married Edward W. North, and they spent the rest of their lives in this house. Carter L. Hudgins, et. al. 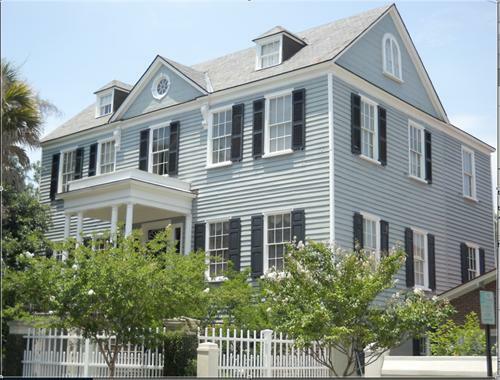 The Vernacular Architecture of Charleston and the Lowcountry, 1670-1990. Historic Charleston Foundation, 1994. 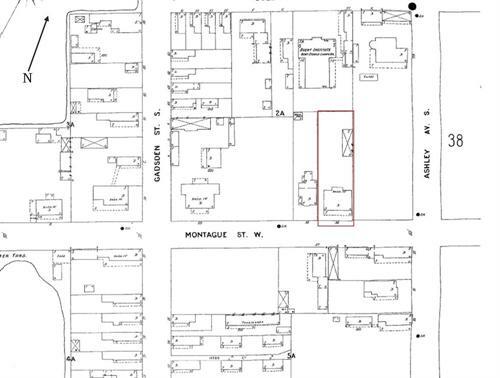 In 1801, Isaac Motte Dart bought the lot shown as "E," where he built 54 Montagu Street. 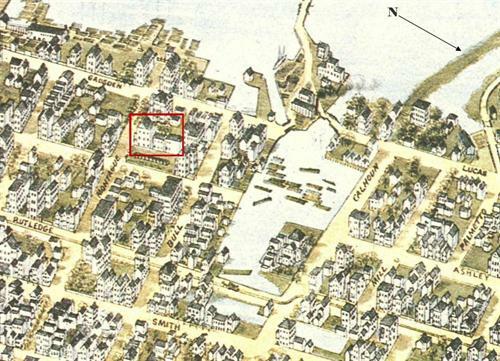 Part of Col. John Harleston's estate, these eleven lots were divided among Harleston's three daughters. Lots B, E, and F were allotted to Jane (Mrs. Edward) Rutledge. Joseph Purcell, surveyor. "Part of Harleston in the City of Charleston…" 1795. View of 54 Montagu Street, 1872. 54 Montagu Street in 1902.